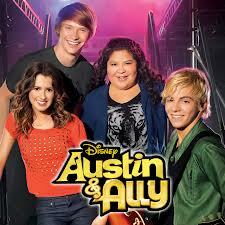 Austin & Ally is a show that premiered on Disney Channel in the United States on December 2, 2011. The series was created by Kevin Kopelow and Heath Seifert, the writers and producers of Disney Channel sitcoms Sonny with a Chance and Jonas. Production for the pilot episode began in mid-February 2011. On May 25th, 2011, Disney Channel announced that Austin & Ally had being picked up for a late 2011 premiere. The first promo was released on October 14th, 2011 during Disney Channel's Make Your Mark: The Ultimate Dance-Off event. A series preview followed the premiere of the Disney Channel Original Movie Good Luck Charlie, It's Christmas! The series follows the partnership between polar opposites — Austin Moon, an extroverted musician/singer, Ally Dawson, a brilliant yet shy songwriter and their two best friends, Trish and Dez. Unbeknownst to Ally, Austin and Dez "borrow" one of her songs, record it, create a video and post it on the Internet, after which it and Austin become a local internet sensation. When Trish convinces Ally to tell the world she wrote the song, Austin pleads with her to write another hit for him. Instead, the two combine their talents to create a true musical tour-de-force. Ross Lynch portrays Austin Monica Moon, better known as Austin Moon, whom is a teenager that is propelled to stardom after he becomes an overnight internet sensation with the song Double Take, which he "stole" from Ally, thing that made her very angry at Austin, but after all, she forgave him, and they became good friends and partners. Laura Marano portrays Ally Dawson, the brilliant and talented teenager whom is restricted to only writing songs because of her paralyzing stage fright. Because of this, Ally eventually decides to become Austin's songwriter, even after he steals her song, Double Take. But, in the second season, Ally conquered her stage fright and wanted to focus on her own career, and also helping Austin write songs for him. Raini Rodriguez portrays Patricia Marie de la Rosa, better known as Trish, whom is the sarcastic, vindictive, ill-tempered, and lazy teenager that constantly gets fired from jobs due to her lack of effort and presence at work. However, she takes her job as Austin's manager very seriously. In Season 2, in the episode Partners & Parachutes, she became Ally's manager too, after she conquered her massive stage fright. Calum Worthy portrays Dez, whom is Austin's goofy and random best friend. He, however, manages to be quite serious when he does his job and directs Austin's projects. 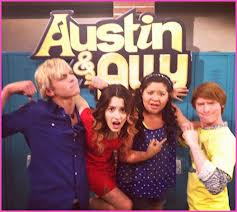 On May 25, 2011, Disney Channel announced that Austin & Ally had been picked up to a series. The pilot was directed by Shelley Jensen. Casting for the series regulars were held nationally around the United States and shooting for the pilot began in  Los Angeles Center Studios in early March 2011. It was announced in May 2011 that production had begun on the series. On September 29, 2011, it was announced that Disney Channel had extended the show's episode order from 13 episodes to 21. Season 1 began airing on December 2 (as a preview), and December 4, 2011. On March 11, 2012, the show was renewed for a second season, and resumed production during the summer of 2012. Season 2 began airing on October 7, 2012. Production officially ended for the second season on February 1, 2013. At the Disney upfronts, on March 12, 2013, the show was planned to be renewed for a third season. On April 2, 2013, Adam Bonnett, Senior Vice President of Original Programming for Disney Channel Worldwide, offically confirmed the season. Production is scheduled to begin again in July 2013, and is to begin airing in October 2013. Each episode of Austin & Ally has a trademark where it always has '&' in the title. ......that Laura Marano starred in "Ni Hao Kai-Lan " as Mei Mei? ......that Laura Marano guest starred in two episodes of "True Jackson VP "? ......that Ross Lynch is in a family band called R5, in which he sings and plays guitar? ......that Calum Worthy had his first TV appearance when he was 9? ......that Raini Rodriguez's brother is Rico Rodriguez who stars in ABC Family's comedy Modern Family? ......that Raini Rodriguez is Tess in the movie "Prom"? ......that Laura Marano used to be on Are You Smarter Than A 5th Grader? ......that Ross Lynch was one of the back up dancers for Cymphonique Miller's "Little Miss Swagger" music video? ......that Both Laura Marano and Raini Rodriguez guest starred in Dexter when they were young? ......that Calum Worthy guest starred in Good Luck Charlie with Matt Prokop? ......that Raini Rodriguez was in the movie Paul Blart mall cop with Kevin James? ......that Laura Marano's older sister, Vanessa Marano, is starring in ABC Family's Switched At Birth as Bay? ......that Laura Marano starred in Heroes episode "1961"? ......that Laura Marano sang the 8th track on the Disney Fairies album Faith, Trust, and Pixie Dust? ......that Laura Marano is a songwriter outside the show? ......that the show's theme colors are yellow, black, and red? ......that Ross Lynch plays ice hockey? ......that Austin & Ally was renewed for a third season? ......that "Austin & Ally" along with "JESSIE" are TV's Top 2 Series Across Kids 2-11, Kids 6-11 and Tweens? ......that "Austin & Ally" stood as TV's #1 series across target demos, with the network home to the Top 2 TV series in Kids 2-11 and Top 4 TV series in both Kids 6-11 and Tweens overall? ......that "Austin And Ally" And Disney XD's "Lab Rats " share the same stage? ......that Ross and his brother Riker were in the music video Ordinary Girl by Miley Cyrus as Hannah Montana? ......that Ross already recorded the first song from the third season of Austin & Ally? ......that Laura Marano co-wrote the song Finally Me that her character Ally sings on the episode Tracks & Troubles? ......that Laura Marano's first kiss was with co- star Ross Lynch? ......that Season 3 premired on October 27th? ......that Laura Marano guest starred on Liv and Maddie in the episode "Howl-A-Rooney"? ......that the UK gets 2 weeks of new episodes? ......that Austin & Ally has been renewed for a season 4 on April 25, 2014? ......that Laura Marano will star in a movie "A Sort of Homecoming"? ......that Austin & Ally is the first Disney Channel Original Series to get a fourth season where a family isn't a part of the main cast? ......that Austin & Ally is the first Disney Channel Original Series to get a fourth season that has less than 5 main characters? ......that Austin & Ally is the first Disney Channel Original Series to get a fourth season that has co-leads and where the lead is a male? ......that Grace Phipps, who was Ross Lynch's co-star in "Teen Beach Movie" guest starred in Season 3 episode Directors & Divas? ......that NBA star Dwyane Wade will guest star in one of the episodes in Season 3? ......that Calum Worthy will star in a movie "Mostly Ghostly 2"? ......that Austin & Ally was 2013's number one series for kids 9-14? ......that Austin & Ally was announced for a Season 4 on April 25th, 2014? .......that Laura Marano will be in a new DCOM called Bad Hair Day? ......that Raini Rodriguez will star in the Disney Channel Original Series Growing Up & Down? ......that Raini Rodriguez will be in Paul Blart Mall Cop 2?